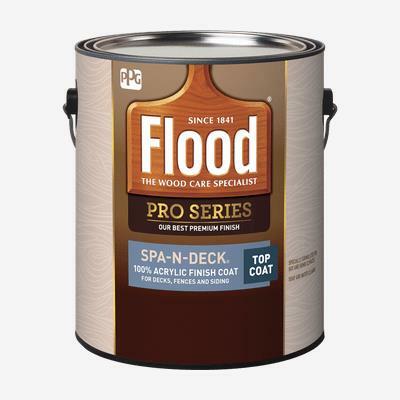 FLOOD® PRO SPA-N-DECK® 100% Acrylic Finish Top Coat is a system that delivers excellent adhesion and provides a beautiful, lustrous color that enhances the natural look of wood. Specially formulated for tropical weather environments and recommended for use on any properly prepared exterior wood, including decks, fences, siding, railings, outdoor furniture and other wood surfaces. Apply to new, dry, pressure-treated wood, uncoated new or less weathered wood, or wood previously stained or painted.